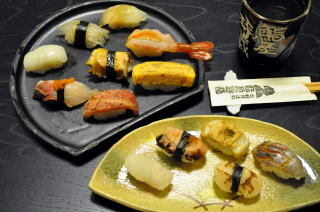 Tokizoh serves authentic sushi with fresh seafood from the local area. It is the sushi restaurant film director John Woo (“Face/Off”,”Red Cliff”, “Mission: Impossible II”) came when he visited Kumamoto, and enjoyed sushi to his heart’s content! Exquisite seasoning on the top of the sushi makes it possible for you to enjoy sushi as it is, that is, without adding soy sauce yourself. The master says you can enjoy sushi with your fingers (without using chopsticks). 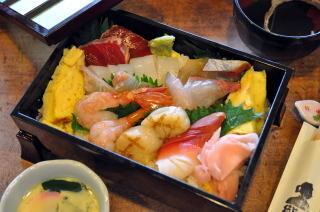 As for “gari” (ginger) you can have it either with your fingers or with chopsticks. 穴子山椒添え　conger sea eel (seasoned with sansho)　Its sauce is made from “dashi” of eel bones, and the master has had the sauce for 30 years! This is our favourite sushi place downtown. 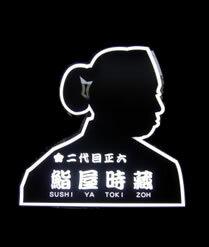 The sushi master is so friendly and the atmosphere is welcoming. He lived in Hawaii for some time so I'm sure he speaks English if you're not comfortable speaking Japanese. It's great value - highly recommended.